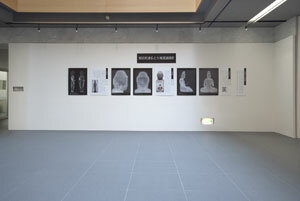 Starting September 18 (Friday), the Department of Research Programming is in charge of a panel exhibition at the entrance of Institute titled “Investigation and research of Buddha statues, using X-ray photography”. 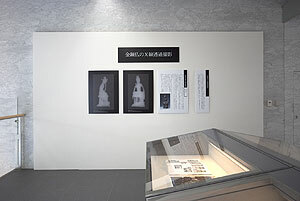 This exhibition was planned to introduce the investigation and research that has been conducted up to now, with the cooperation of the Center for Conservation Science and Restoration Techniques, as part of the research project of the Department of Research Programming titled “Cross-Disciplinary Study of Art Materials and Techniques”. The panel exhibition is scheduled to be held until the end of this year. From September 25 to 27, 2009, a symposium titled “Tracing Japanese Buddhism” was held in commemoration of 50 years since the founding of the Center for Japanese Studies of University of California, Berkeley. The American, Japanese and European researchers who are majoring in Buddhism-related areas, such as Buddhist religion, Buddhist history and Buddhist art history, met and gave many lectures and reports. Vivid discussions were held with nearly 80 participants each day, offering precise opportunities to learn about each other’s research results. 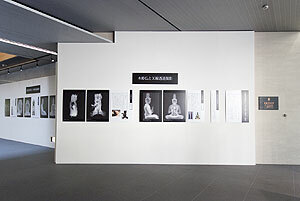 On the first day, there was a panel discussion on Buddhism art history on the topic of “Numinous Materials and Ecological Icons in Premodern Japanese Buddhism”, Sarai made presentations on the Healing Buddha of Jingoji temple, an outstanding statue sculpted from one wood, of the early Heian Period, as one of the panelists. Other panelists conducted reports that included the latest information, such as knowledge on recent research results about the species of trees used for carved wooden statues. In the US there seems to be many unknown things about Buddhist statues, partly because there is small number of researchers on Buddhist sculptures in Japan. We wish to positively promote international exchange, making use of opportunities like this, so that people will be interested in Japanese Buddhist statues. Imaizumi Yusaku’s Kijishu: Volume 2 includes sketches of Korin Yatsuhashizu, and the figure pattern and color note in sketch specifies that the original art work was Tales of Ise Yatsuhashizu which currently belongs to Tokyo National Museum. 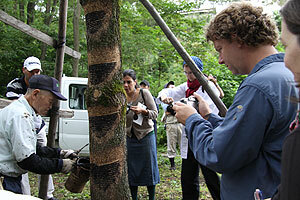 Since the Institute opened in 1930, it has collected and arranged materials concerning cultural heritage. We are making efforts to catalog them so they can be released to public and viewed; however, among the materials which we have accumulated over nearly 80 years, there are some materials which have not been released for public viewing and have not been arranged. Kijishu by Imaizumi Yusaku, introduced in this article, is one of the works which has been in obscurity for a long time. Mr. Imaizumi Yusaku (1850 – 1931) worked for the Education Ministry, Tokyo Fine Arts School (current Tokyo National University of Fine Arts and Music) and Tokyo National Museum, and sustained the art administration of modern Japan together with Okakura Tenshin. 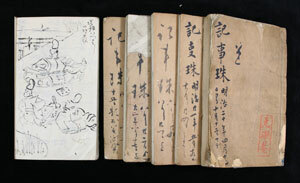 Kijishu is Imaizumi’s autobiographical diary collection, dated from 1887 to 1913 and totaling 38 volumes in all. In these diaries he recoded the art works he appraised and investigated in detail with his sketches. These diaries were found by Mr. Yoda Toru (Saitama City Culture Promotion Agency) who was a student at that time, during an arrangement of materials. The authenticity was confirmed by Ms. Yoshida Chizuru, a visiting researcher at our Institute, who already had records through her research of Imaizumi Yusaku. Ms. Yoshida is now writing a new work about Kijishu, and made an interim report at the workshop of Department of Research Programming on September 30. Imaizumi’s records of wide-ranging antiquities have attracted great interest of researchers majoring in various fields, and we have recognized the importance thereof. The Department of Intangible Cultural Heritage has been recording live performances of historical narratives told by master storytellers Ichiryusai Teisui and Takarai Bakin since 2002 (the former Department of Performing Arts). We asked both masters to perform continuous performance of long stories, opportunities for which are less frequent in recent years. 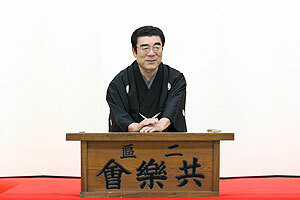 Starting this year, master storyteller Kanda Shori has also assisted us. Shori also excels in performing long, continuous stories. From his large repertoire, he selected Tokugawa Tenichibo (a samurai story) and Banzuiin Chobei (a townsman story). 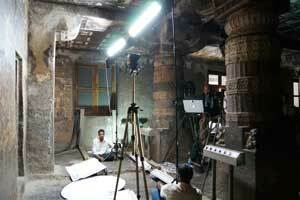 The first recording was conducted on September 29. From September 2 to 15, the Center for Conservation Science and Restoration Techniques held an international course on the Conservation of Urushi (Japanese Lacquer) jointly with the ICCROM (International Centre for the Study of the Preservation and Restoration of Cultural Property). This course consisted of lectures, practices, and an informational tour. Nine trainees from eight countries (Austria, Germany, UK, Poland, Russia, Portugal, Canada and the US) participated in this course and learned the history of urushiware, the science and survey methods of lacquer, traditional urushiware techniques, and repair philosophy and methods of urushi objects and lacquer coating, from each specialist. On the study tour, trainees visited the outskirts of Joboji-machi of Ninohe City, which produces nearly 80% of urushi made in Japan. They first toured to the Hachinohe City Jomon Museum and Goshono Jomon Museum to see the excavated lacquerware in the Jomon Period, which forms the roots of urushi in the Japanese islands, and then viewed the urushi sap collecting at Joboji-machi and the creation of urushi sap collecting tools at adjacent Takko-machi in Aomori Prefecture. At the Ashiro Lacquerware Technological Center in Hachimantai City, they viewed actual Japanese lacquer refining work, and also saw the urushimuro (a warehouse for urushi coating) and urushi paint tools that were used from the Taisho Era to the beginning of Showa Era and are rare nowadays. They ended the tour with a visit to Chusonji Temple’s Konjikido Hall. Most trainees who participated this time belonged to art galleries and museums that owned urushiware works from Japan and had trouble in handling them or were otherwise involved in actual restoration sites. 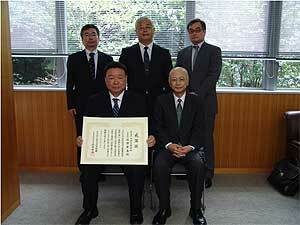 Therefore, they had very high awareness of the surrounding issues and were very earnest. One of their comments made a particular impression on me: “I learned a bit about Japanese lacquer, but I had an even better experience for my future carrier because I was able to learn by watching and studying the actual objects and work process”. 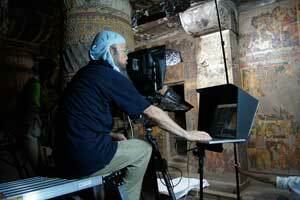 The National Research Institute for Cultural Properties, Tokyo and the Archaeological Survey of India (ASI) are conducting joint research on the conservation of Mural Paintings of the Ajanta Caves under the framework of ”Networking Core Centres for International Cooperation on Conservation of Cultural Heritage” funded by the Agency for Cultural Affairs. The mural paintings of the Ajanta Caves have been damaged by rainwater entering the caves through cracks in the basalt, bat excrement, (whitening and blackening), artificial factors, and have discoloration issues due to the yellowing of the shellac (varnish coatings) used for previous restoration work and cracks and floating in the colored layers. In the second mission undertaken in September, 2009, all of the mural paintings in the second cave were subject to high-definition digital photograph recording and colorimetry to record in detail the conservation status of the mural paintings. We photographed and measured the murals together with the Indian specialists, aiming at sharing knowledge and technical exchange on digital documentation for conserving cultural heritage. The National Research Institute for Cultural Properties, Tokyo is conducting joint research on conservation of Thai cultural heritage together with the Fine Arts Department of the Ministry of Culture of Thailand. We executed a joint on-site investigation from September 14 to 16. Wat Sri Chum of the Sukhothai ruins has a great Buddha statue taller than 15m, the core of which was made from bricks and the surface finished with plaster. The entire surface of the Buddha statue had been covered with moss and algae, but because of the water repellent treatment applied 11 years ago, the Buddha statue was kept clean for awhile. However, since dirt due to algae, etc. 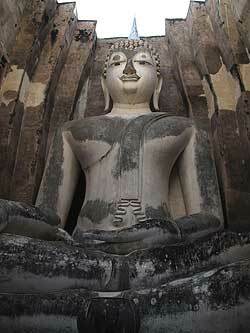 has been somewhat noticeable recent years, some countermeasures have been investigated through observation of the Buddha statue, experiments by sample installation, and micrometeorological observation. In addition to these activities in Wat Sri Chum, we have observed the surrounding ruins, and specifically reviewed the advantages and disadvantages in cases where a chamber was installed in the remains.